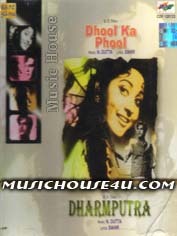 Dhool Ka Phool/Dharmputra is the only real Bollywood soundtrack CD I own. The first song on this album, Tere Pyar Ka Aastra Chahta Hoon, was a song they used to play a lot on the Bollywood video show Namaste America. I have fond memories of watching it in college on Saturday mornings in the dorm lounge with my friend Antara. It wasn’t very long ago, but that was before you could find videos on the internet very easily, so I haven’t seen it since. Antara explained to me what’s going on – they’re having some girls versus boys school debate in song form. I haven’t seen the film, but I would guess the two singers end up together at the end of the story! Watching the video now, it’s not as cute as I remember it being, but it’s still pretty good. I think part of the charm was that it was different and more subtle than all the other more modern videos played on the show, which usually involved glamorous people frolicking in famous locales. The other songs on these soundtracks are pretty good too, if you can deal with high-pitched singing. I get them stuck in my head even without comprehending a single word. The songwriters and arrangers of the time were obviously very good at what they did and I’m guessing they were under-appreciated for their talents.